Alina was the best selling imported indicator in the USA during the 1960's. These indicators and dial bore gages were made in Geneva, Switzerland, by Compac, a company in existence since the 1930's. They were distributed by Alina Corporation, an independently owned company, out of Mineola and later Plainview, New York. Fred Senn, a Swiss compatriot, was the president of Alina Corporation until the early 1980's. By that time, Compac had started to put its own name on the dials. The indicators with series numbers such as K24 and M31 were discontinued in the mid 1960's and replaced by the IXL series which proved too heavy and cumbersome. Sales dropped off, partly because of the new Japanese competition (the Mitutoyo catalog at the time consisted of a few pages of newsprint!) and Compac redesigned their indicators into their current form. The bore gages likewise underwent a transformation and became the best selling Interapid dial bore gage. Compac was ultimately purchased by Brown & Sharpe in the mid 1990's which was subsequently acquired by the Swedish firm of Hexagon SA with world headquarters in London. Today they are doing business as Tesa Technology (Switzerland). When Alina Corporation closed, Fred Senn continued his business in Northport, New York, under the name Senn Company. Mr. Senn passed away in October of 2002. 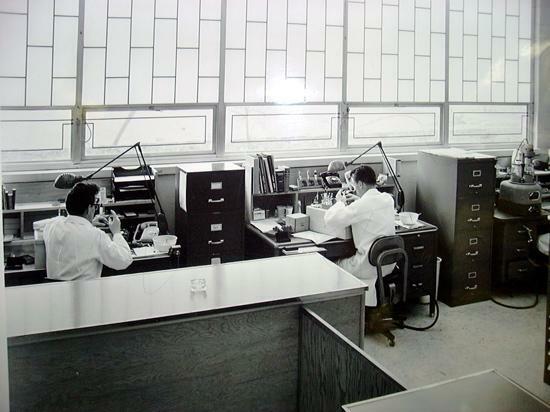 George Meyer, the founder of Long Island Indicator Service, was the repair service manager at Alina Corporation. He passed away in September of 2011 at the age of 83. Herbert Meier (shown in the photo above, not related) created Dengel Associates and passed away in January 2013. René Meyer, president of Long Island Indicator Service until 2014, was instrumental in designing the spare parts lists for the Alina and Compac indicators. He retired in 2017.